The Suffolk Legislature approved a local bill Tuesday that would bar pharmacies from selling tobacco products, with lawmakers saying tobacco sales run counter to the stores' role in the protection of public health. The bipartisan resolution was approved on a 16-1-1 vote, with Republicans Steve Flotteron opposed and Leslie Kennedy abstaining. “Selling tobacco products is directly at odds with a pharmacy’s mission as a health-oriented business,” said Legis. William Spencer, a physician who sponsored the measure. He noted that the state pharmacy society backs the move and major chains like CVS have already adopted such policies on their own. Michael Seilback, an assistant national vice president of the American Lung Association, hailed the measure. “Pharmacies are a vital part of the health care delivery … they shouldn’t be selling a product that kills 50 percent when used as directed.” He said Massachusetts has a statewide tobacco pharmacy ban, as do Erie and Albany Counties, and the cities of Albany and New York. Spencer said the measure will not only bar sales of cigarettes, cigars, chewing tobacco, electronic cigarettes, and electronic tobacco liquids, but also vaping products popular with young people. He said the only exception will be products authorized by the state for nicotine replacement therapy. The measure imposes a civil penalty of up to $2,000 per violation, but only after a hearing before the county health commissioner. The bill will take effect 180 days after the measure is filed with the state secretary of state. In a bare 10-vote majority, the legislature also approved County Executive Steve Bellone’s proposal to create a charitable tax fund as a way to avoid Donald Trump’s restrictions on state and local tax deductions. Bellone’s proposal is similar to one put forward by Gov. Andrew M. Cuomo, but the IRS has already indicated such a plan would not be acceptable. Republicans failed to table the measure, but in the final vote, Republicans and Democratic Legis. Al Krupski abstained, while GOP Legis. Kevin McCaffrey and freshman Rudolph Sunderman were out of the room for the vote. Krupski said he voted against the proposal because Bellone aides could not provide estimates of what a taxpayer could save. Earlier, Alexis Weik, Islip tax receiver and head of the tax receiver association, said the proposal would cost towns hundreds of thousands of dollars to change their computer systems and would direct them to do things not now permitted by law. ”No portion of this legislation conforms to any of our laws,” she said. Bellone aides promised to involve town officials in working out details of the charitable trust and would not seek to put it into effect until at least 2020. In other action, the legislature confirmed the five-year appointment of Frances Pierre, 55, of Deer Park as Suffolk’s social services commissioner, the first African-American to run the $301 million agency. He will earn $171,000 a year. 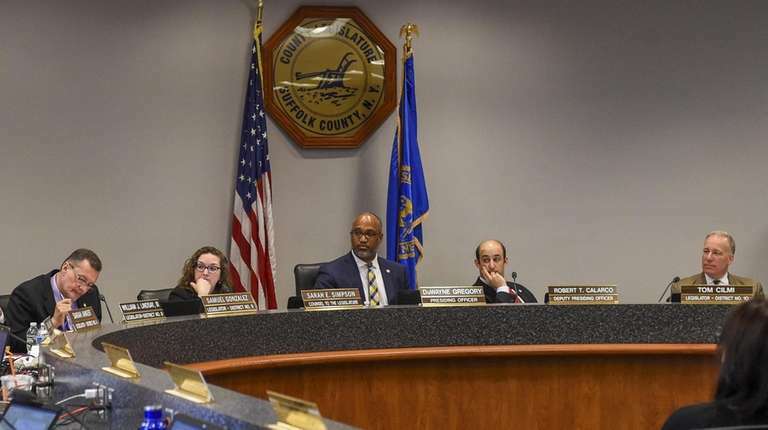 The legislature also approved a procedural resolution taking the first step toward authorizing Presiding Officer DuWayne Gregory (D-Copiague) to issue subpoenas for an investigation to protect a county whistleblower who disclosed potentially improper government action. The resolution authorizes the hiring of an outside law firm to come up with documents and witness needed for the inquiry within 14 days, which will be brought back to lawmakers for another vote. Lawmakers didn't identify the whistleblower or the specifics of the case. The lawmakers also approved a partial $10 million rollback of controversial mortgage fees that bring in $30 million a year which Bellone says is to help taxpayers cope with the federal limits on state and local tax deductions. Critics called it an election year ploy because the cut only helps those involved in a home sale or refinancing and leave the bulk of the fee hike in place. The lawmakers also approved a five-year contract with TerraVelo Resorts Glamping concession for upscale camping at 30 sites, which will cost campers $300 a night at Cedar Point County Park. The county, under a five-year contract, will get $20,000 the first year to $50,000 in the fifth year, plus 10 percent of the gross revenues.